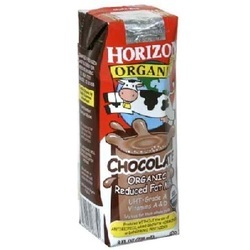 Horizon Organic Low fat Chocolate Milk provides a great-tasting and easy way to add calcium to your family's diet. They are available in low fat half gallons and quarts. Our milk is as good for you as it is delicious because it's produced with no antibiotics, no added growth hormones and no dangerous pesticides. Our cows eat only organic feed and have access to clean water, fresh air, organic pasture and exercise.